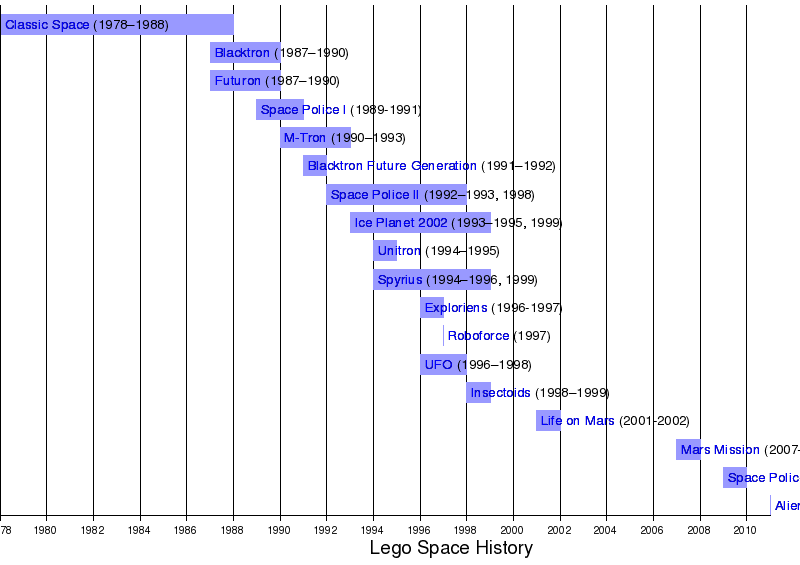 Space is one of Lego's oldest themes, along with Castle and City (back then named Town). It started with Classic Space, then progressed onto themes of good and evil (Blacktron, Futuron), eventually adding aliens (UFO). It was discontinued in 1999 after Insectoids. It was reintroduced in 2001, but discontinued until brought back with Mars Mission in 2008. Space dissapeared for 7 years, between Life on Mars and Mars Mission. The Discovery theme and the Star Justice Factory subtheme were Space-Related, but through those years no Space-Themed sets were released.